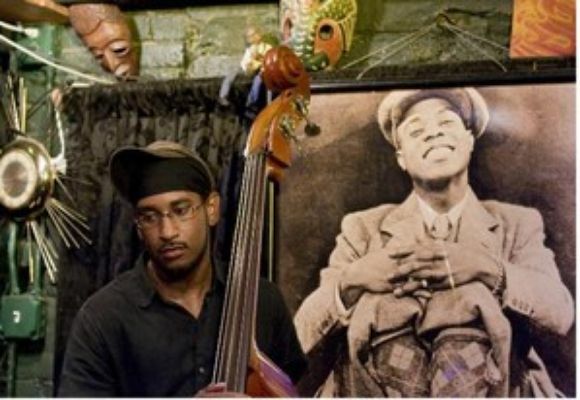 Born in Newark, New Jersey, Jamale Davis started started studying bass in 2003 as a means of actively understanding what it takes to express oneself via the art of Jazz. His studies consisted of playing along to records and teaching himself to read music, but his best education was once he started hanging at Smalls and Fat Cat, his musical home. These places helped and inspired Jamale in the cultivation of his particular aesthetics to bass playing: the acoustic, non-microphone approach, gut string setup with a concentrated lean towards more straight-ahead bebop idiom translated in his repertoire and approach to everything musical..
Jamale is mostly known and regarded for his tenure and continued correspondence with unsung hero Ned Goold and his groups, where he's held the resident bassist position for over five years and recorded a number of albums. Playing a weekly gig at Smalls for a number of years provided Jamale with the 'on the job training' that helped cultivate his skills as a bassist.. Since 2012 Jamale has lead his own group at various places in the nyc/nj area that consists of some of the best musicians on the scene today. This has also contributed to Jamale releasing his debut album on Gut String Records called Workers' Comp in October of 2015.